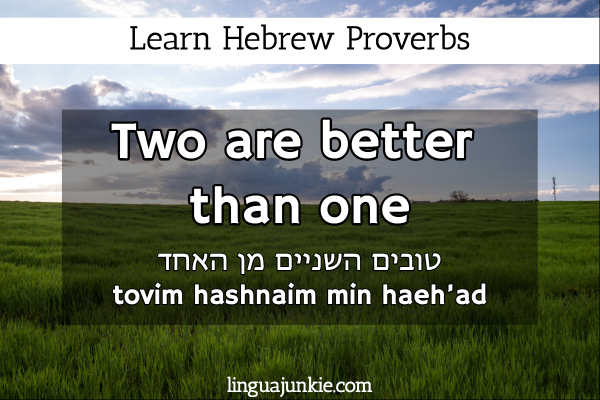 If you’re learning Hebrew, you should learn Hebrew proverbs too. Why? Because you can whip them out in conversation when necessary. Knowing them gives you more things to say. Also, they’re pretty inspirational. So, that makes them fun to learn. So, set aside 3 minutes and read these juicy Hebrew proverbs! May I suggest a Hebrew learning program? It’s called HebrewPod101.com. 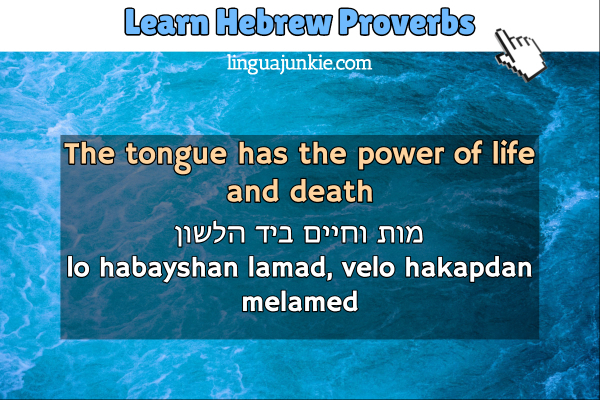 If you’ve always wanted to speak the language, you can and will with their Audio/Video lessons by Hebrew teachers. You get over 500+ lessons, tons of apps, study tools and PDF eBooks. Click here to get a free lifetime account. You can read part 3 here (up to #30). 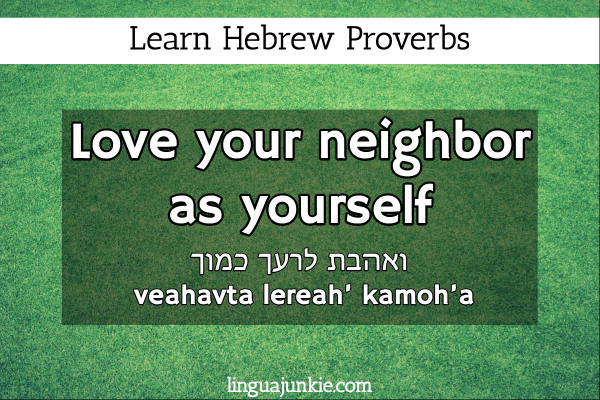 Meaning: This Hebrew proverb is from the Old Testament of The Bible and it means that you have to treat others with love and respect in the same way that you would like others to treat you. Meaning: Two and more people always have more power than one man or that it is better to be with someone than to be alone. In other words, partner up and make friends! Meaning: A person who is not brave enough to ask questions can not learn, and an overly strict teacher, whom it is hard to ask something, will not be a good teacher. 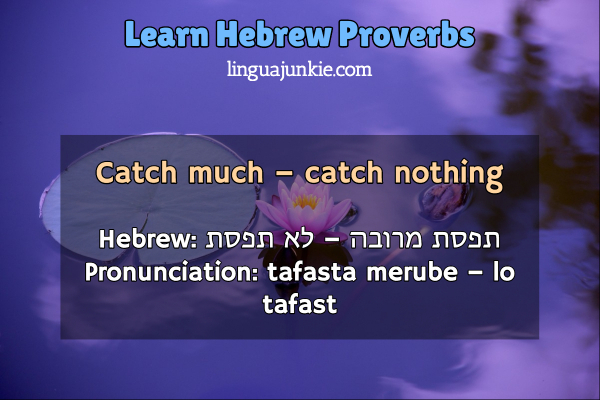 This is one of my favorite Hebrew proverbs. If in the context of learning Hebrew, if you’re shy, you’ll never get to speak and practice. So, you won’t learn. Meaning: The things we say are extremely powerful. They have the power to kill someone or save someone’s life. Words can actually deeply hurt or bring great happiness to others. 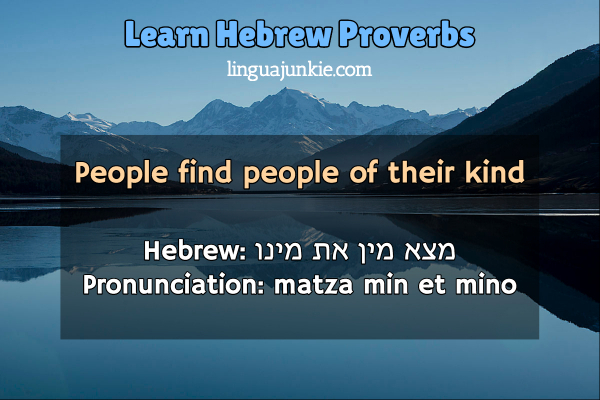 Meaning: This proverb says that people usually find friends that are similar to them in some way. 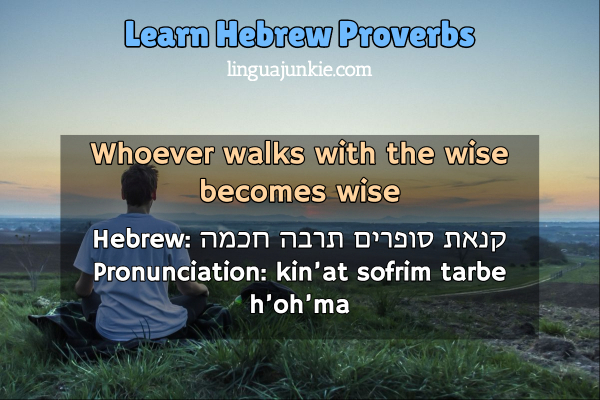 Meaning: The literal meaning of this Hebrew proverb is: communication between wise people makes them even wiser. That means that being in the company of wise and highly educated people helps people become wiser and smarter. Meaning: Any will of any man should be respected by others, even if we disagree with this man. Meaning: A person who is careful with the things they say keeps all the troubles away. This is very true. The amount of times I’ve said things that I didn’t mean is ridiculous! Or things that you think “sound good” in the moment but aren’t really in the end. Meaning: A person who tries to do many tasks and to achieve much might end up losing everything. It is better to concentrate on fewer things and to be sure that you can handle them all. 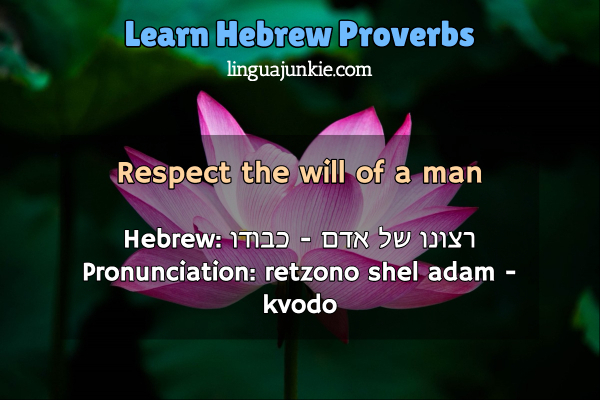 What does Hebrew proverb mean? It means that multi-tasking does not work! 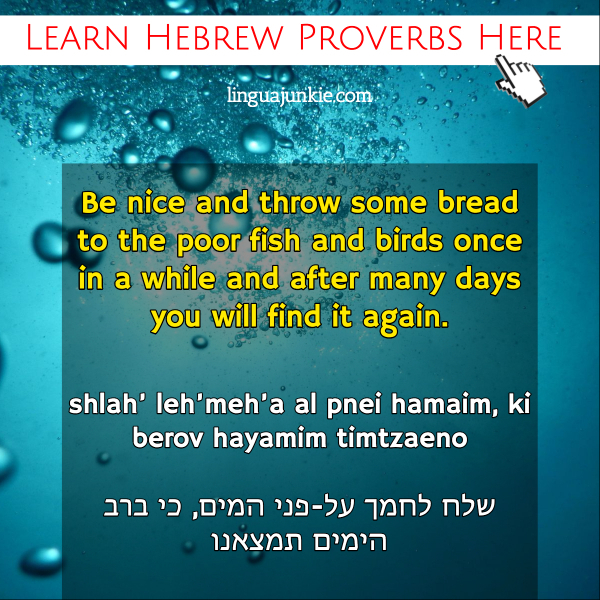 40) Be nice and throw some bread to the poor fish and birds once in a while and after many days you will find it again. Meaning: Be generous to others when you can and other will be generous to you when you are in troubles. All our good deeds return back to us like a boomerang. That’s why I’m writing and publishing these articles for you. Maybe you’ll return the favor and learn Hebrew! 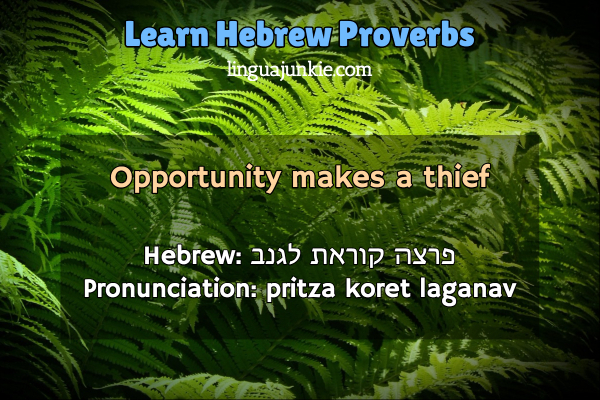 Meaning: This proverb can be literally translated as “an open door or fence call the thief.” Or in other words, things that we leave in the open or things we don’t watch after attract thieves. Meaning: No one can be right when arguing about tastes because each and every one has his / her own taste, so it is not a good subject for a dispute. 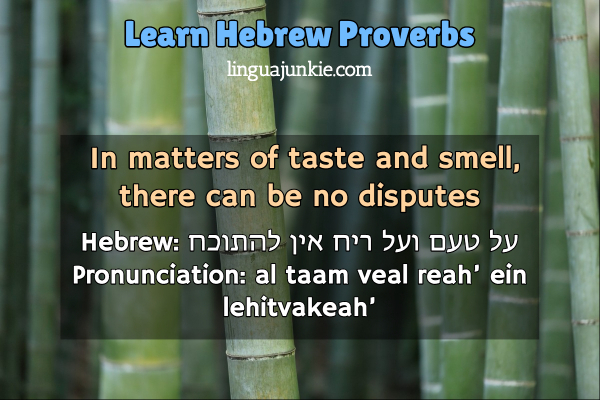 So, stop arguing about your favorite Hebrew proverbs. They’re all great. Meaning: The literal meaning is everyone who sees imperfections in others actually sees his own imperfections in himself. We tend to see our own imperfections in others, while not noticing them in ourselves. 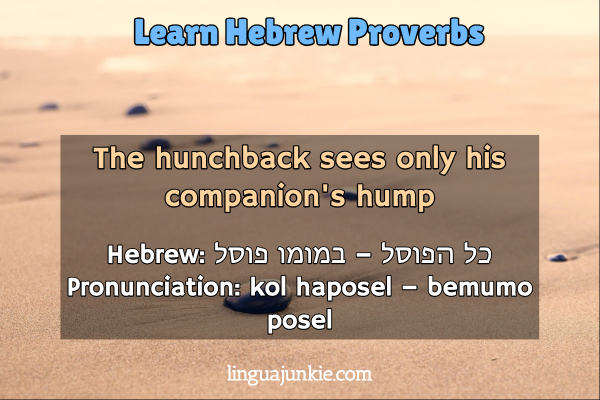 Hence, the hunchback sees his friend’s hump but totally ignores his own. Meaning: Silence is gold and if is it is better for wise people to speak less, then fools should not speak at all. 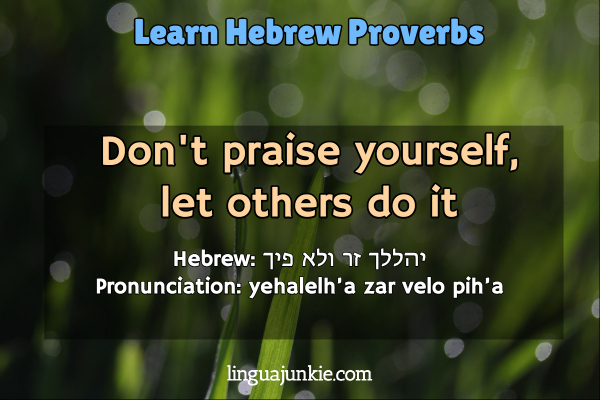 Meaning: It is better not to praise yourself, but to let other people do it for you. If we do so we might end up looking selfish and arrogant. Meaning: When people have a good opinion about you, it is much more important than all the most precious and expensive things on earth. 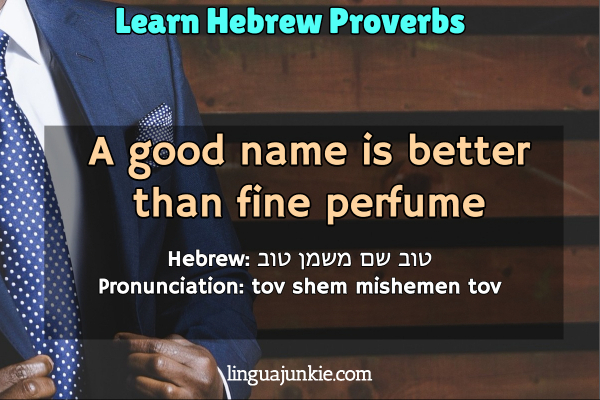 In other words, like a whiff of strong perfume, your reputation or name precedes you. Meaning: It is better to be the last among the good and wise men and to be able to learn from them than to be the first among the wicked and fool ones. Now you some awesome Hebrew proverbs and sayings. 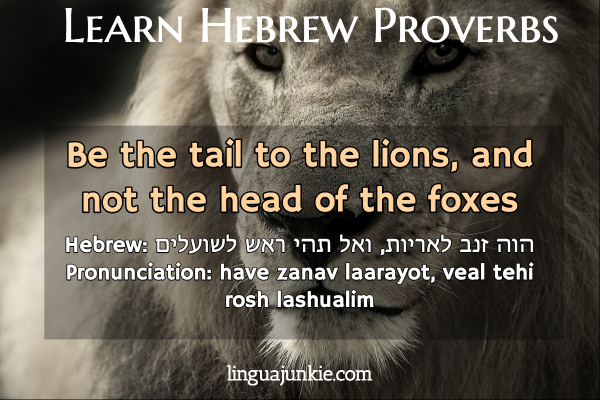 And, if you read the “pronunciation,” you can also say them in Hebrew. 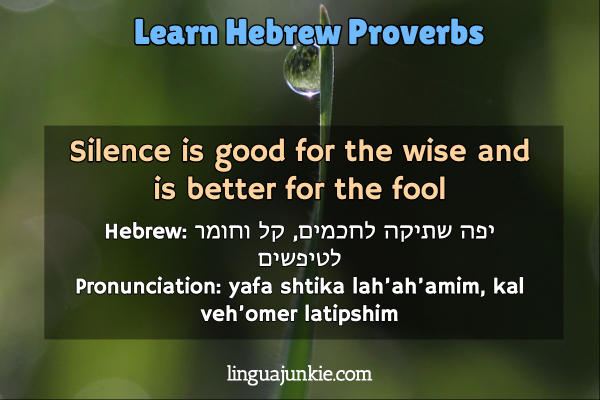 Stay tuned for more Hebrew proverb lessons. If you’re interested in MORE Hebrew lessons, click below.